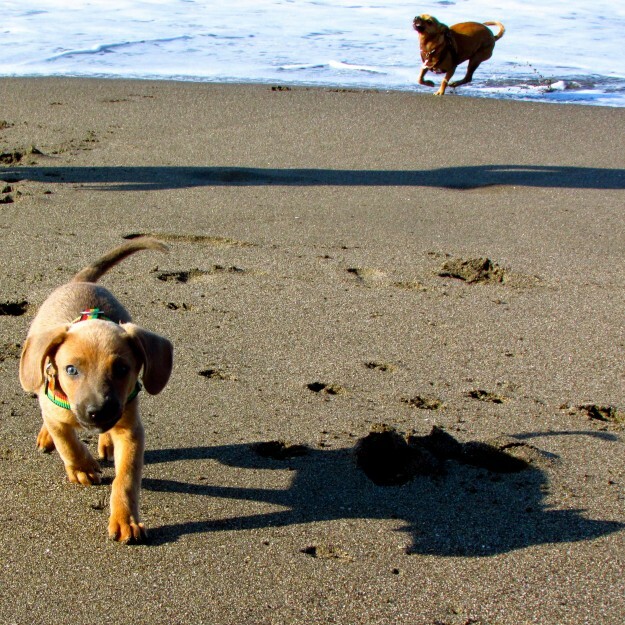 Is there anything better than a new beach to explore? Here I am in Las Penitas. I knew the day we left El Salvador was going to be a long one. First of all, Victoria and Jason dragged me out of bed just as the sun was rising. Jason’s been getting up with Maya at all hours of the night for weeks now, but I would much rather sleep in. On this morning I didn’t get a choice. We were heading out of El Salvador, through Honduras and into Nicaragua all in the same day, and there was no time for beauty sleep. 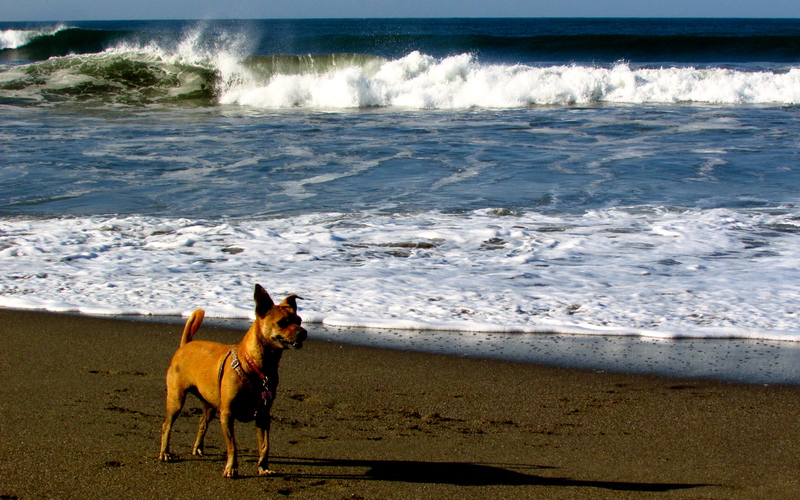 There was barely time for another sniff around Playa El Cuco before we were packing up and hitting the road. Back down the bumpy dirt road, a couple of hours driving across the last stretch of El Salvador and we were at the border. By the time we left El Salvador the sun was high and hot, and both me and Maya were panting pretty hard. I’m still not particularly thrilled with this new ‘little sister’, but I did feel bad for her, laid out on the ground while My Family got us through the border. I’m used to this process by now, but everything’s so new for Maya. She’s just a baby! Luckily everything went smoothly and we were soon back in the big truck and heading into Honduras. Since it was going to be such a long drive we gave in to a couple of comforts. There was air conditioning for me and Maya, and soda in a bag for Victoria and Jason. I’ve never seen that before, and it was certainly an adventure for Jason to drink from a bag while driving! Thankfully, that was the most adventurous part of this drive. Jason and Victoria had been stressed out about Honduras for as long as I could remember. It was the only country we weren’t really going to see so the plan was to drive through this teensy little bit of the country, just enough to get into Nicaragua. It was only eighty miles or so, but My Family had heard the drive could take all day because of police checkpoints. 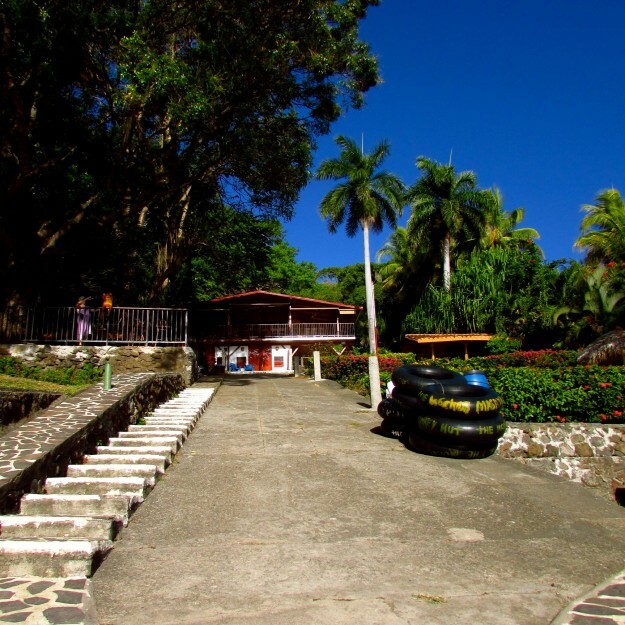 My Family relaxed pretty quickly, however, as we didn’t get stopped even once driving through Honduras! Maya slept through the whole thing; I don’t think she can smell nerves on humans yet. Although we didn’t hit any issues we did have to get through both borders in a single day, and by the time we entered Nicaragua we were all pretty tired. It was super hot, and after all the stress of a long driving day everyone was super excited to get to our campsite for the night. Luckily, it wasn’t very much further. We got out to our first top in Nicaragua, the beach town of Las Penitas, just before the sunset. We found a great little hotel right on the beach called Playa Roca, and the super nice owners were happy to have us camp there. Even though we were all exhausted, I still got a chance to run on the beach a bit. This part of the Big Adventure was certainly shaping up well. So many beaches to run on! After months of shivering at night in the mountains, all of this sun and sand made me one happy dog. 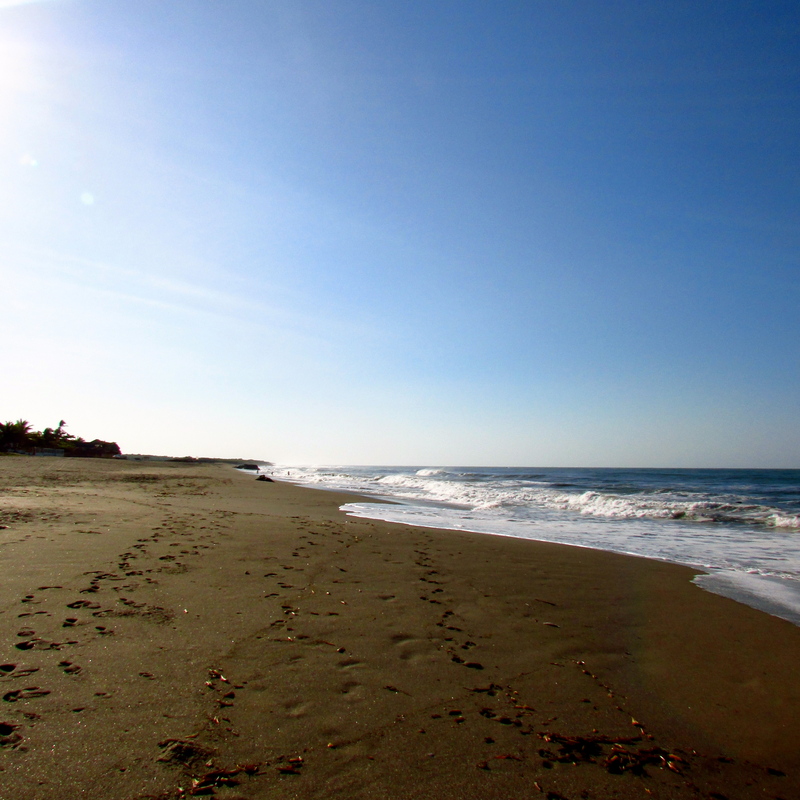 The beach in Las Penitas was empty most of the time! 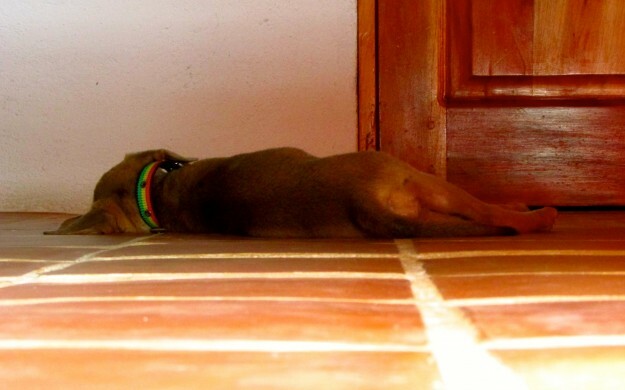 We spent a few days in Las Penitas, and boy was it HOT! It was hard to do much else but lay around, and thankfully there were plenty of shady spots. Maya wants to play all the time, but even she got tired of chewing on my face in this weather. I didn’t even mind so much when Victoria took me in the ocean or under the shower. This was a great beach, with plenty of room to run, lots of nice people and other dogs, and delicious food to taste. Jason didn’t have it quite so good as I did. He had to take the bus into Leon twice to get supplies and find internet so he could work. Even though lots of people go to Las Penitas for fun there are no real shops there, which makes it pretty tricky for Adventurers like us. Maya is SUPER slow and she trips over her big feet all the time. I’m slowly teaching her how to run. It kept getting hotter, and then there were crazy dust storms that covered My Family head to foot in sand. Victoria and Jason started to seriously drag. Even Maya was running for cover. 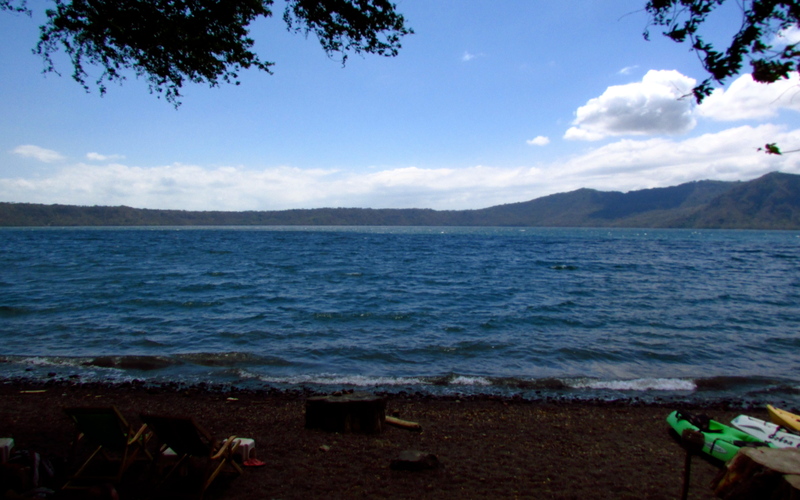 After a while we knew it was time to go, so we packed up the big truck and headed for our next stop, Laguna de Apoyo. This drive was nice and short, something I’ve noticed is pretty much normal now. Victoria says that these Central American countries are much smaller than Mexico and even Guatemala, meaning we can see a lot more of them in a short amount of time. We drove through a couple of small towns, stopped on the side of the highway so My Family could get another tank of gas for the truck, scaled a big hill and caught our first look at Laguna de Apoyo. It’s much smaller than Lake Atitlan in Guatemala, and the drive down was way less scary, but this place was just as pretty. It’s in the middle of a volcano! I don’t really know what that is, but it was pretty cool to see a lake that was almost a perfect circle. Victoria also said that this volcano has been a lake for a very long time, so I didn’t think there was anything to be nervous about. 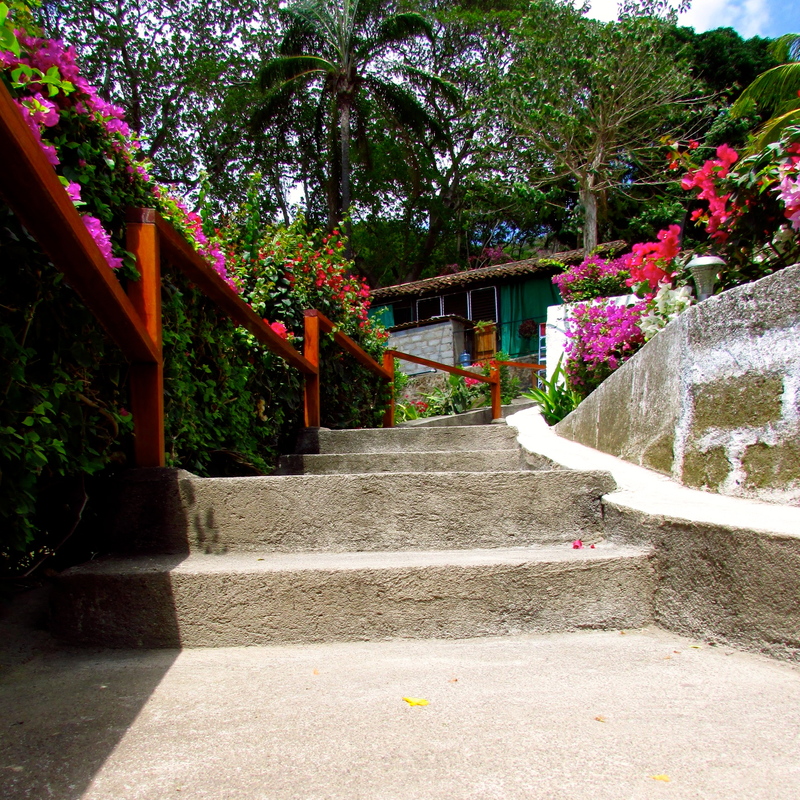 There were lots of steps to get from the lake to our room at the Monkey Hut but I didn’t mind! Maya loved laying on the cool tiles in our private room which was fine by me because it meant I had the bed all to myself! We could only have one night in the comfy room, but instead of leaving the next morning My Family decided to stay in a dorm room. This was definitely a first for us on the Big Adventure. A dorm is basically a big room with lots of beds, and you share it with other Adventurers. Jason wasn’t too sure how this was going to, and he was even less pleased when we found out that the whole dorm was going to be full of girls. Thankfully they turned out to be super nice, and Maya managed not to pee inside or cry or anything. I guess she’s starting to be a little more fun. Laguna de Apoyo. Better to swim in than the ocean but I’m still not loving it. We left The Monkey Hut for another spot down the road so we wouldn’t have to share a room with anyone. This place was called Hostel Paradiso, and it was super cool. So pretty, with all sorts of levels, great grassy bits, hammocks to swing in, and delicious food I got to taste. We spent a couple of nights in our own room here, relaxed during the day while Jason worked, and spent the evenings down by the beach, swinging in hammock chairs and meeting all sorts of nice people. I’m happy to report that the travelers we met were just as interested in me as they were in Maya. As it should be. Lots of stairs at Paradiso but at least Maya is getting better at climbing them (finally). Hostel Paradiso was probably my favorite spot in Nicaragua so far. This is Victoria’s favorite country, and I could certainly see why. The people were so nice, and there was loads to do. I actually enjoyed swimming here, as long as Jason held me tight. I played a bit with Maya, and got more than enough beauty sleep. We even got to move back into the camper our last night there, and met a nice couple from Switzerland who had been traveling for two years! I have to admit I didn’t really want to leave, and I think Jason felt the same way. But we had to keep moving. Victoria made reservations in a hotel in a city called Granada, so after a couple of days we got back on the road. The stress of our big border crossing day was pretty much forgotten, and it was time to see more of Nicaragua! Maybe we’ll find someone in Granada who would take this puppy off our hands. Just kidding! Well, sort of. PS: My Family has been pretty lazy about taking photos lately but you can see some of our time in Nicaragua on Facebook.